Some bird species can be found on the Oregon Coast year-round. Others stop by briefly on their spring or fall migrations. 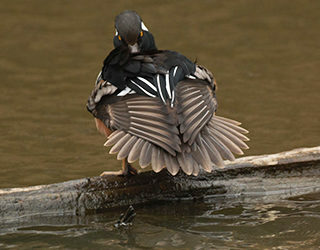 And then there are birds that only winter here, including this hooded merganzer fanning his feathers. 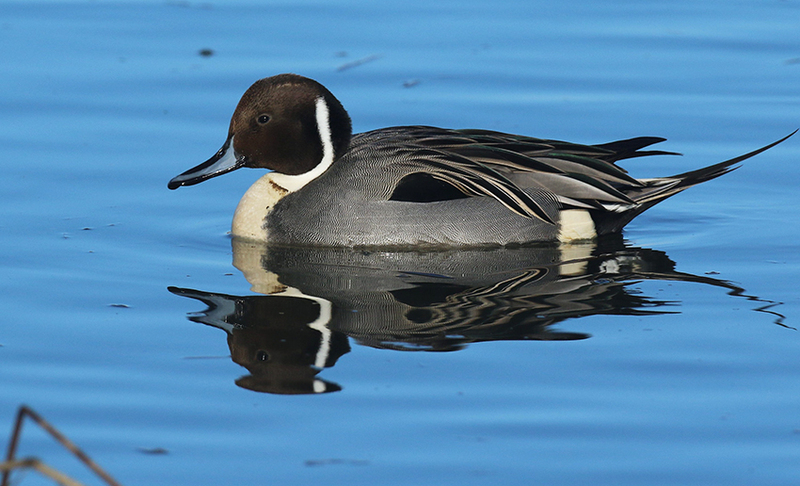 If you want to see wintering waterfowl, the time is now. A pair of binoculars will help you spot them. 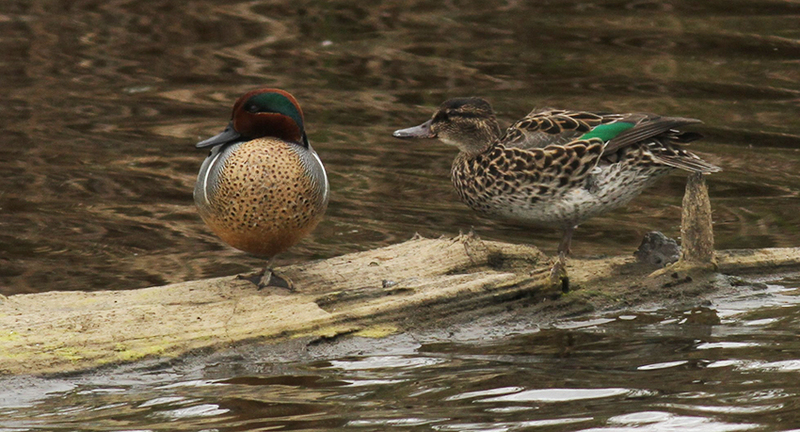 Look for waterfowl in the ocean and in the estuaries, including open water on some NCLC properties. 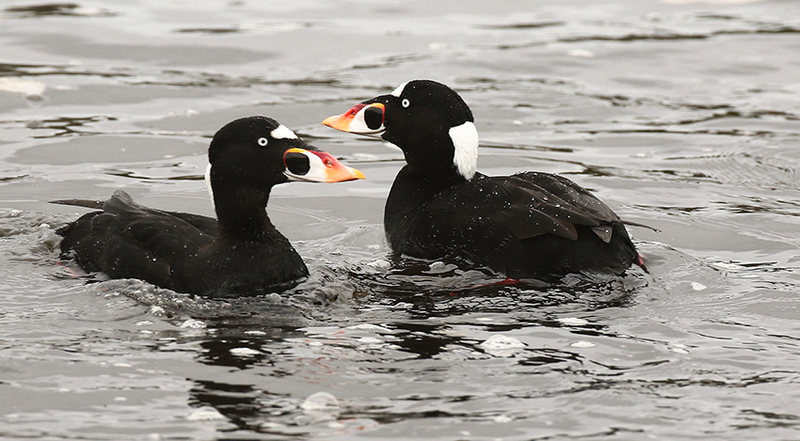 Neal Maine, who photographed all these birds on the northern Oregon Coast, urges you to take a day to look for birds in a variety of habitats, from the lower Columbia River to estuaries along the coast. “We live in a habitat-rich environment,” Neal says. 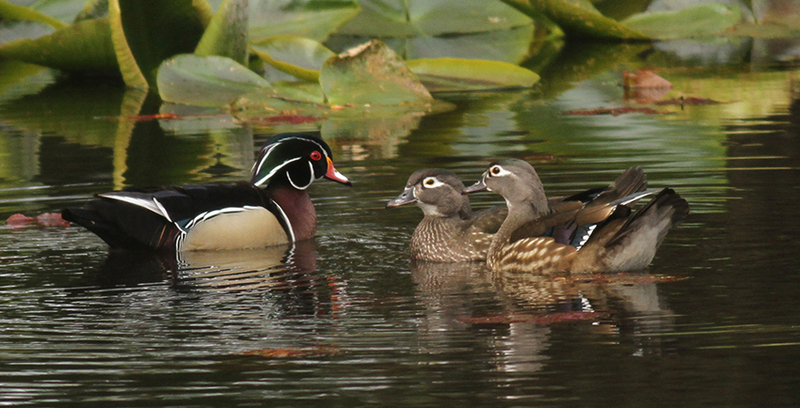 Harlequin ducks migrate, but not north to south: in summer they head to small streams in the mountains to nest. Look for them in winter in turbulent waters close to shore such as the Cove in Seaside, where Neal caught these ducks, or the large rocks just inside the mouth of Tillamook Bay at high tide. Neal normally sees widgeons in the estuary–they are the dominant bird in the estuary this time of year, he says–but he caught this raft of widgeons offshore at the Cove. 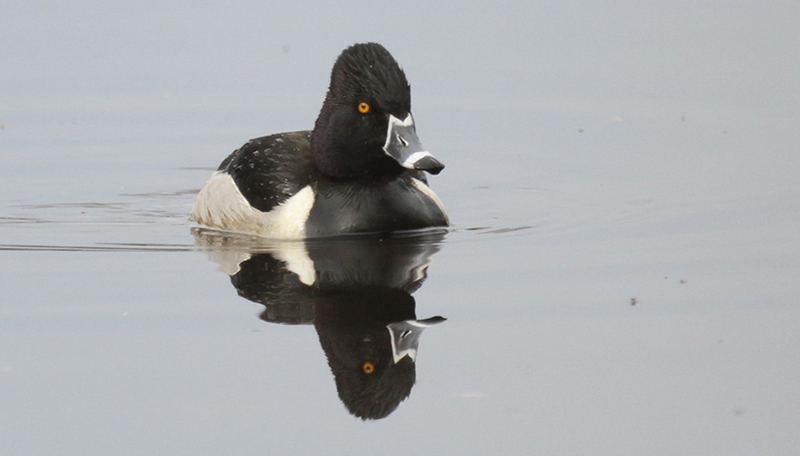 Ring-necked ducks tend to flock in small groups of four to eight birds, Neal says. “In your wanderings, you never know when you’re going to see a once-in-a-lifetime bird,” Neal adds. This Steller’s eider, for example: she showed up last winter in the ocean off Seaside when, according to the bird guides, she should be in the Aleutian Islands. 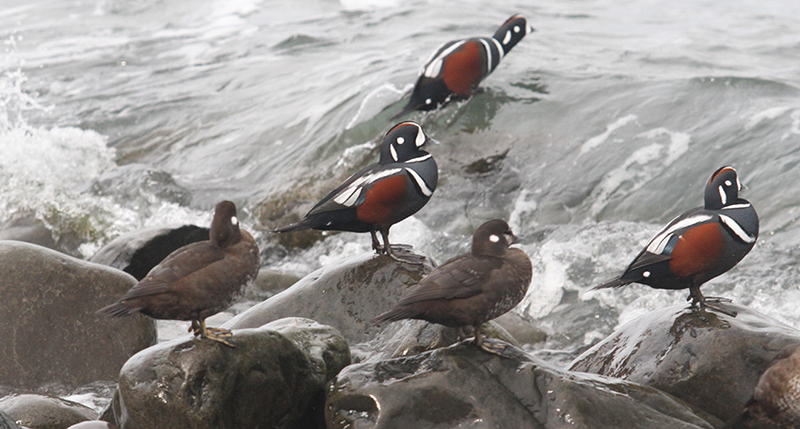 Neal spotted her riding the waves with harlequin ducks at the Cove. 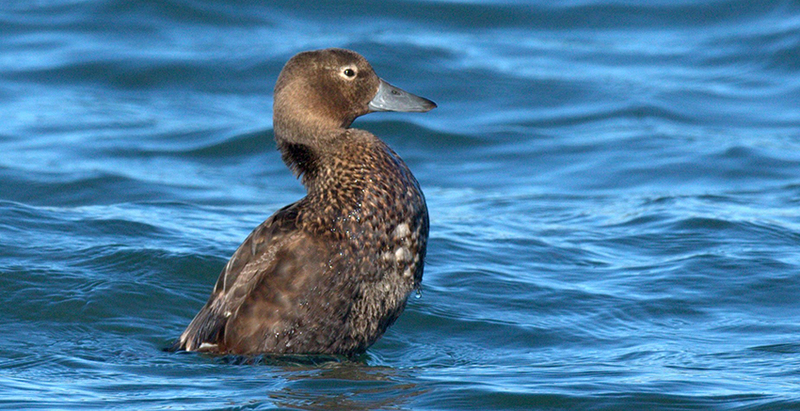 The male eider, like the male of many bird species, is much more brilliantly colored than the female. But Neal’s close-up demonstrates that she has an exotic beauty of her own. Thank you, Neal, for a water birds tour full of breath taking beauty and personality. I am forwarding this to my son and his family in Wisconsin so his children get a glimpse of the natural world of the coast. I will also post it on our website and other social media if it’s ok with you. Thank you again for sharing. And I will donate and participate in trees planting! Will Neal teach a photography class to those who only knew how to push button to do better? Thank you! I take my binoculars whenever we go out. Pond behind FM? We will have to look for that. Thank you Trung: Share away!